Watch year: 1960. All images shown are of the actual watch. 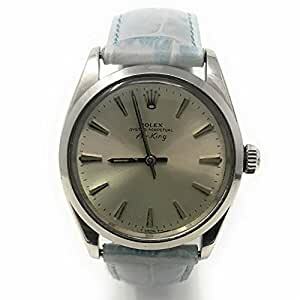 ROLEX, AIR-KING, 5500, SWISS-AUTOMATIC, NEW, PRODUCTION YEAR:1960, CASE MATERIAL: STAINLESS-STEEL, CASE DIAMETER: 34.0 MILLIMETERS, BEZEL MATERIAL: STAINLESS-STEEL, DIAL COLOR: SILVER, BAND MATERIAL: LEATHER-SYNTHETIC, GENERIC BOX, EXTERNAL CONDITION: EXCELLENT, BUY WITH CONFIDENCE KNOWING EACH TIMEPIECE GOES THROUGH THE SAME RIGOROUS 31-POINT INSPECTION. REST ASSURED ONLY AUTHENTIC PARTS STRAIGHT FROM THE MANUFACTURER ARE USED. THE CERTIFIED PRE-OWNED PROGRAM ON AMAZON ENSURES PEACE OF MIND AND TRANSPARENCY VIA STANDARDIZED REPORTS AND A 1 YEAR WARRANTY PROVIDED BY WATCHFACTS.